India is one of the fastest growing major economies2 and growth in its gross domestic product during 2018 and 2019 should be approximately 7.5 per cent.3 While aggregate M&A transaction volume has increased (1,022 transactions in 2017 compared to 895 in 2016), the aggregate transaction value in 2017 decreased by 12 per cent from the US$53.2 billion in 2016. The fall in the value is a result of fewer 'big-ticket' deals in 2017. This may be on account of regulatory changes such as demonetisation, implementation of goods and services tax (GST) and greater scrutiny by regulators.4 During 2017, there were 682 domestic M&A transactions accounting for 67 per cent of the aggregate transaction volume. The aggregate volume of outbound M&A decreased to 340 in 2017 from 367 in 2016. Communication, energy and natural resources, manufacturing and information technology and information technology-enabled services witnessed maximum traction in M&A in 2017 (see Section V for details). The acquisition of the government's stake in Hindustan Petroleum Company by Oil and Natural Gas Corporation has been the largest M&A transaction so far in 2018, valued at around US$5.5 billion. While the communication sector was the forerunner in terms of aggregate transaction value, it was the financial services sector that witnessed the largest number of transactions. The principal statutes governing M&A are the Indian Contract Act 1872 (the Contract Act), the Companies Act 2013 (the Companies Act), the Competition Act 2002 (the Competition Act), the Foreign Exchange Management Act 1999 (FEMA), the Insolvency and Bankruptcy Code 2016 (the Insolvency Code) and subsidiary legislation. Listed entities must additionally comply with, inter alia, the SEBI5 (Substantial Acquisition of Shares and Takeovers) Regulations 2011 (the Takeover Code), the SEBI (Prohibition of Insider Trading) Regulations 2015 (the Insider Trading Regulations) and the SEBI (Listing Obligations and Disclosure Requirements) Regulations 2015 (the LODR Regulations). The Contract Act sets the paradigm for definitive agreements. Importantly, non-compete stipulations are relatively limited and damages will not be awarded in excess of the loss suffered. Concomitantly, liquidated damages are, effectively, a cap on damages that may be awarded depending on the extent of loss proved. Punitive damages are not awarded. The board of an Indian company must approve any acquisition or divestment of shares. If the aggregate of the consideration (including for business or asset transfers) and the amount of guarantees or securities extended by the company (to a company other than any of its wholly owned subsidiaries), or proposed to be extended, exceeds the greater of 60 per cent of the acquirer company's paid-up capital, free reserves and securities premium account, or 100 per cent of its free reserves and securities premium account, then at least 75 per cent of the shareholders must also approve. The Companies Act mandates free transferability of shares of a public company but recognises private arrangements between its shareholders as valid contracts. Implicitly, pre-emptive rights and restrictions on transfer are enforceable inter se shareholders. Public, private, sole trader and 'small companies' are permitted. The latter two are geared towards promoting domestic entrepreneurship. The Companies Act permits schemes of compromise or arrangement between a company and all or a class of its creditors or members. Schemes can effect a restructuring, merger, demerger, hive-off or other reorganisation. Schemes involving listed companies require SEBI and stock exchange prior approval at two stages: one month before the application to the NCLT for sanction and after NCLT sanction. Schemes involving foreign companies require approval from the Reserve Bank of India (RBI) before filing with the NCLT. The transferee company must ensure that the valuation in respect of such schemes is conducted by recognised professional valuers in accordance with the internationally accepted principles on accounting and valuation. Under the Companies Act, every Indian company must have at least one director who was resident in India for at least 182 days in the financial year; this period is proportionately adjusted for newly incorporated companies at the end of the financial year of incorporation. Every public company, whether listed or unlisted, must additionally have at least two independent directors if its paid-up capital exceeds 100 million rupees, its turnover exceeds 1 billion rupees or its debt exceeds 500 million rupees. The Companies Act defines a 'related party' as including a holding, a subsidiary and associate companies9 (including foreign companies) and entities in which directors are interested. All contracts with related parties that are not at arm's length must be approved by the board in meeting and, where the consideration exceeds specified thresholds, by a shareholders' resolution. The Competition Act prohibits persons or enterprises from entering into a combination that has or is likely to have an appreciably adverse effect on competition within the relevant market in India. Separately, the Competition Commission of India (the Competition Commission) must approve a combination if the assets or turnover of the entities proposing to combine exceed prescribed thresholds. In March 2017, the government prescribed that, in the case of a business or asset transfer, the exemption from Competition Commission approval would be available if the value of the relevant assets being transferred or the turnover attributable thereto was within the threshold. This is a welcome change that brings the requirements of Indian competition law in line with global standards. The Competition Commission publishes a summary of every notice of a combination received for stakeholders to review and submit their comments. * A 'group' means two or more enterprises that are directly or indirectly in a position to exercise at least 50 per cent of the voting rights in another enterprise, to appoint 50 per cent or more members on the board of directors, or control the management or affairs of the other enterprise. until November 2022, any combination involving central public sector enterprises13 operating in the oil and gas sectors under the Petroleum Act 1934 or under the Oilfields (Regulation and Development) Act 1948. The exemptions in points b, c and h are not available if the transaction results in a change in control. The Indian rupee is not freely convertible, and the FEMA and its subsidiary rules and regulations restrict transactions between Indian residents and other persons. FDI is subject to pricing guidelines. These guidelines require the purchase price of shares to be at least the fair value (in the case of an Indian selling shares) or not more than the fair value (in the case of an Indian acquiring shares) determined by any internationally accepted pricing methodology. The valuation must be contemporaneous with the transaction. Foreign investors may pay the entire consideration for an acquisition or subscription up front or defer, including through escrow, up to 25 per cent of the total consideration for up to 18 months. Similarly, indemnity obligations to a foreign investor of up to 25 per cent of the consideration are permissible without prior government approval. The Insolvency Code is the first Indian legislation that contemplates a time-bound resolution of insolvency. The NCLT shall within 14 days of the application being submitted either admit or reject the application. The process under the Insolvency Code, once admitted, is required to be completed within 180 days of the date of it being admitted. If no resolution plan is admitted within these 180 days, the NCLT may pass an order for liquidation. A further extension of 90 days may be granted by the tribunal if 75 per cent or more of the committee of creditors approves the extension. No extension after the expiry of 270 days is permitted. If still no resolution plan is admitted within these 90 days, the NCLT may pass an order for liquidation. Currently, certain lacunae exist as, among others, tribunals across the country have interpreted the provisions of the Insolvency Code differently.16 Additionally, applications, once accepted, may not be withdrawn without leave from the Supreme Court. However, recommendations have been made to resolve issues arising from the Insolvency Code and there continues to be hope that it will facilitate quick and effective resolution of financial stress. The Takeover Code is a comprehensive code that applies to a change of control of listed companies (other than companies listed without making a public issue on the institutional trading platform)17 of a recognised stock exchange. 'Control' includes the right to appoint a majority of the directors, or control the management or policy decisions of a company, and applies to the acquisition of shares or voting rights. The Takeover Code mandates a public offer on acquiring 25 per cent or more of the shares of a listed company and, if a shareholder already holds shares to that extent, on acquiring more than 5 per cent of the shares of that company in any 12-month period ending on 31 March. A public offer must be for at least 26 per cent of the voting rights or shares of the target company (excluding shares held by the acquirer), subject to maintaining the mandatory minimum public float of 25 per cent. A shareholder with 25 per cent of the shares or voting rights of a listed company may make a voluntary public offer to acquire at least 10 per cent of the shares of that company, provided that the mandatory minimum public float of 25 per cent remains unaffected. A public offer may be conditional on a minimum level of acceptance and on regulatory approvals. An acquirer may offer cash, shares of another listed company or listed debt securities, or any combination of these, as consideration for the shares tendered in response to the public offer. The formula to calculate the minimum offer price is geared to the historical performance of the shares of the listed company. However, if the negotiated acquisition price is higher than the historical trading price, the negotiated price must be the minimum price of the public offer. Every person making a public offer must deposit monies in an escrow account as performance surety. Indian banks may provide guarantees as surety for non-residents if such guarantees are covered by counter guarantees of a bank of international repute. Every person acquiring 5 per cent or more of the shares or voting rights of a listed company must disclose aggregate shareholding or voting rights to the concerned stock exchange within two working days of the acquisition. Every person holding 5 per cent or more of the shares or voting rights of a listed company must disclose every subsequent acquisition or divestment of 2 per cent or more of the shares or voting rights of the company. Separate annual disclosures must be made on 31 March each year. A target company may be delisted in compliance with the delisting regulations. The promoters may offer to purchase shares held by the public and delisting may be permitted if, following the offer, the promoters hold 90 per cent of the company and at least 25 per cent of the public shareholders have participated in the offer. The open offer process does not get triggered if the shares of the listed company are bought through a tribunal-approved scheme of amalgamation. It was proposed in the HDFC Life–Max Financial Services reverse merger that the promoters of Max were to be paid a non-compete fee of approximately 8.5 billion rupees from which the minority shareholders of Max, a listed entity, would not benefit. Although the transaction was called off as the requisite regulatory approvals were not received,18 media reports suggest that the SEBI is considering inclusion of such mergers and acquisitions under the purview of the Takeover Code. The Takeover Code provides for any non-compete fees paid to be included in the transaction value, while in a scheme of amalgamation, the same may be paid outside the deal value. The Insider Trading Regulations oblige shareholders, promoters, employees and directors of listed companies to disclose any transaction or series of transactions involving shares of a listed company having a trading value of 1 million rupees or more. Insiders may also formulate irrevocable trading plans that are to be publicly disclosed and mandatorily implemented. The LODR Regulations apply to listed entities that have listed 'specified' securities on an Indian stock exchange, and mandate event-specific disclosure and separately, periodic disclosure of, inter alia, changes in shareholding, proposals to change capital structure, information that may have a bearing on the operation or performance of the company, M&A activity, as well as transactions with group companies. The LODR Regulations prevent directors and key management personnel of a listed entity from entering into compensation or profit-sharing agreements with shareholders or third parties in connection with shares of the listed entity without the prior approval of the board and the public shareholders. This proscription was specifically included to regulate arrangements between private equity investors and management of listed entities. Certain mergers, demergers and schemes of arrangement involving a listed company require approval of the majority of the public shareholders of the listed company. 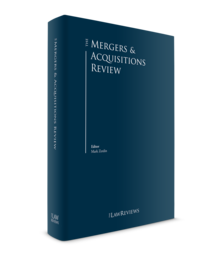 The provisions of the Companies Act relating to mergers and acquisitions have recently been notified, changing the M&A landscape significantly. Previously the Companies Act did not permit the merger of an Indian company with a foreign company and only permitted the merger of a foreign company with an Indian company. However, the Companies Act now permits cross-border mergers with foreign companies in certain jurisdictions, subject to RBI approval. The provisions with respect to cross-border mergers are effective from April 2017. The RBI has recently implemented regulations for cross-border mergers. The Cross Border Merger Regulations primarily combine compliances under various regulations and statutes (e.g., pricing guidelines, sectoral caps, as discussed above). The Companies Act provides that a scheme can be challenged only by shareholders holding at least 10 per cent of the shareholding by value or by creditors representing 5 per cent of the outstanding debt of the company. This should shorten timelines and preclude frivolous objections. India's ranking has improved significantly from 131 in 2017 to 100 in 2018. This improvement can be attributed to the government's consistent efforts in this regard, including the migration of several regulatory functions to e-portals, improving the country's position in the Enforcing Contracts indicator, and the simplification of procedures for tax, labour and corporate regulatory compliance. FDI of up to 100 per cent is allowed in single brand product retail trading under the automatic route for products branded during manufacturing with the same brand as is used globally. This initiative aims to attract a larger number of foreign investors engaged in production and marketing. However, given that local sourcing requirements remain for FDI over 100 per cent, it remains to be seen whether the liberalisation will lead to further FDI. Further, foreign investment in a company engaged in the business of investing and registered with the RBI as a non-banking financial company would fall under the 100 per cent automatic route. However, foreign investment in core and other investment companies is permitted only under the government route. The Startup India initiative promotes entrepreneurship and innovation by helping start-ups secure funding. A 'start-up' is a new entity that is headquartered in India, is less than seven years old and has an annual turnover of less than 250 million rupees. Because of the muted success of this initiative, the government made several changes, the most notable being tax benefits to start-ups, as discussed later in this chapter.19 Certain additional benefits have also been introduced, such as self-certification, funding corpus of 100 billion rupees, concessions on patent and trademark filings, etc. The impact of these changes remains to be seen. Although the value of inbound transactions has decreased by 71 per cent (US$ 6.5 billion in 2017 from US$ 20.9 billion in 2016), foreign investors continue to be key players in Indian M&A. One of the biggest deals of 2017 is the sale of Reliance Infratel Limited's Mumbai power business to Adani Transmission Limited. The sale will further Reliance Infratel Limited's deleveraging strategy. The transaction is valued at around US$2.8 billion. The biggest deal of 2018 so far has been the acquisition of the government's stake in Hindustan Petroleum Company of about 51 per cent by Oil and Natural Gas Corporation, which is India's largest producer of hydrocarbons. The transaction is valued at around US$5.5 billion. The acquisition aligns with the government's strategy of managing investments in public sector enterprises and thereby improving the economic value of such enterprises. In the biggest inbound transaction of 2017, Flipkart raised capital from a consortium comprising eBay Singapore, Microsoft and Tencent, and acquired the Indian arm of eBay as part of this transaction. The transaction was valued at US$1.4 billion. Reliance Communications, Reliance Infratel and Reliance Telecom propose to sell their tower, wireless spectrum, media convergence nodes and optical fibre assets to Reliance Jio. Media reports indicate that the transaction is valued at approximately US$2.7 billion and that the proceeds will be used to repay the debts of these entities. The sale is pending insolvency and oppression and mismanagement proceedings before the NCLT and the National Company Law Appellate Tribunal. The automotive sector witnessed the biggest outbound transaction this year with Motherson Sumi System acquiring PKC Group for approximately US$604 million. The telecom passive infrastructure sector was the focus of significant activity in 2018, with American Tower Corporation purchasing Idea Cellular and Vodafone's stand-alone tower businesses for an aggregate consideration of US$1.2 billion, and Bharti Infratel and Indus Towers announcing a merger valued at approximately US$15 billion. The financial services sector attracted the maximum number of deals in 2017. The biggest transaction in this sector was the merger of IndusInd Bank Limited and Bharat Financial Inclusion Limited, which was also the biggest transaction in Indian microfinance to date. The transaction was valued at approximately US$2.4 billion. The infrastructure sector continued to grow in terms of value, which is essentially attributable to Reliance/Adani, and recorded an aggregated value of US$5.4 billion. Within the energy sector, clean energy was the forerunner in terms of value, which amounted to around 75 per cent of the volume. Indian industry is experiencing a digital revolution with each sector capitalising on technology. Media reports suggest that convergence across sectors will be key in dictating, inter alia, restructurings and M&A deals. The growth in the technology sector can be primarily attributed to increased internet penetration and government initiatives facilitating the same. The technology sector recorded the highest inbound activity in 2017. Some notable deals include Google Inc's acquisition of Halli Labs, a start-up that is engaged in developing artificial intelligence. Fintech firms witnessed healthy activity; some notable deals include the acquisition of Accelyst Solutions and Freecharge Payment Technologies (collectively, the 'FreeCharge' brand) by Axis Bank, which marks the first acquisition of a digital payments company by a bank in India. Indian banks are precluded from funding M&A other than providing guarantees as surety for offshore acquirers if such guarantees are covered by counter-guarantees of a bank of international repute. Non-banking financial companies (NBFCs) provide acquisition finance, but are subject to exposure norms that apply to business sectors, a single borrower and affiliated companies. Therefore, the available finance is limited and expensive. While a foreign investor may encumber shares of the relevant Indian company to secure credit facilities raised outside India, prior RBI approval is required if the proceeds of the credit facilities are to be used for further acquisition, and the required approval is not forthcoming. Leveraged buyouts (LBOs) are limited in Indian M&A as the Companies Act prohibits a public company from providing financial assistance to any person for the purposes of acquiring the shares of that public company. While this structure does not apply to private companies, LBOs are rare, although slowly gaining ground. Given the difficulties in raising finance from more 'traditional' sources, structured equity and quasi-equity investments are the preferred routes to raise acquisition finance. Consideration may be paid over time on the basis of earn-outs or other specific deliverables being achieved, but as Indian law requires delivery of shares of a public company against payment, transactions must be carefully structured. Contracts of employment cannot be specifically enforced under Indian law. Therefore, if an employer company undergoes a change in control, there is a de facto requirement to obtain employee consent. Employees' consent must be handled sensitively, but as long the terms and conditions of their employment are not adversely affected by the transaction, they are likely to give their consent. In larger industrial establishments, the prior consent of the relevant state government may be required, and this, too, is generally forthcoming. As contracts of employment are not enforceable by the specific performance of Indian law, key personnel may be offered a retention bonus or other incentive as appropriate. The RBI prohibits all entities regulated by it (i.e., banks, NBFCs and payment system providers) from dealing with virtual currencies, or providing services20 to facilitate any person or entity dealing with virtual currencies. Regulated entities that are currently dealing with or facilitating dealing with virtual currencies were required to discontinue such activities by 6 July 2018. The RBI's proscriptions are currently being challenged before the Indian courts. M&A in India is subject to income tax, stamp duty and, in the case of asset sales (including certain business transfers), GST. However, a business transfer structured as a transfer of an undertaking as a going concern with no specific consideration allotted to each transferred assets (a slump sale) is exempt from GST. Indian law subjects any gains accruing on the transfer of a capital asset to tax. Capital gains arising from both share transfers (of unlisted shares) and asset transfers are taxed as long-term capital gains if the shares or assets are held for more than 24 months prior to completion of the transaction. In the case of a transfer of listed shares, short-term capital gains tax arises if the shares were held for less than 12 months; if held for more than 12 months, capital gains tax does not arise. A transfer of listed shares on the market, whether long-term or short-term, is subject to securities transaction tax. From 1 April 2019, capital gains arising from the sale of listed equity shares, units of equity-oriented funds or units of business trust will be subject to long-term capital gains tax if the shares have been held for more than 12 months and the gain exceeds 100,000 rupees. Note: In the case of non-residents, the benefits of the Double Taxation Avoidance Agreement will be available. For foreign investors, immediate tax efficiency is achieved if the applicable double taxation avoidance agreement permits a lower rate of taxation. No stamp duty applies to transfers of dematerialised shares, and a common condition precedent to completion is that the vendor dematerialises the shares. A slump sale is more tax efficient than an asset transfer simpliciter, as it allows for business losses to be carried forward and, as long as the undertaking has been held for more than three years prior to completion of the transaction, gains are subject to long-term capital gains tax notwithstanding that individual assets may have been more recently acquired. The Bombay High Court has held that the transfer of a business undertaking as a going concern against bonds or preference shares issued was an exchange and not a sale, and was, therefore, not subject to capital gains tax.21 'Slump exchange' structures are gaining popularity on account of their tax efficiency. A court-sanctioned scheme is also tax efficient if, inter alia, shareholders holding at least 75 per cent by value of the original entity become shareholders in the resulting entity. The recently enacted General Anti Avoidance Rules (GAAR) may also prove to be problematic. Essentially, the GAAR enable the tax authorities to declare an arrangement as an 'impermissible avoidance arrangement' if they are of the view that the arrangement has been entered into with the primary intention of avoiding tax. The law provides that there is a presumption of an arrangement being an impermissible avoidance arrangement and it is for the taxpayer to demonstrate that it has commercial substance. As the GAAR provisions are recent, the approach of the tax authorities is not yet known and, consequently, jurisprudence is yet to evolve. After years of uncertainty, attempts are being made to make the tax regime in India more transparent and investor friendly. While intention is articulated frequently, progress on the ground is, arguably, slow. From 1 April 2018, income tax rates of Indian companies having a total turnover or gross receipts of less than 2.5 billion rupees have been reduced from 30 per cent to 25 per cent of the total income. For start-ups set up between April 2016 and March 2021, a 100 per cent deduction of profits is proposed for three out of seven years. Further, start-ups and investors may seek exemption from tax payable out of 'income from other sources' in respect of issuance of shares at more than fair market value, subject to fulfilment of the required thresholds. Indian law deems a foreign company to have a business connection in India if a dependant agent of that foreign company habitually concludes contracts or has a principal role in concluding contracts for and on behalf of the foreign company. This is in relation to contracts that are in the name of the non-resident, or for the transfer of ownership of, or granting the rights to the property owned by the non-resident, or for the provision of services by the non-resident. India looks to FDI as a significant driver of economic development and the legislative support for easing business process should facilitate further investments. M&A activity should increase throughout the rest of 2018 and in 2019, and inorganic growth is likely to rise exponentially. Domestic players are expected to dominate the M&A market. Media reports indicate that the market will most likely witness greater divestments, particularly in sectors that are capital intensive, illustratively real estate, infrastructure, power and cement. Indian assets continue to suffer financial stress. The Insolvency Code, the resolution process prescribed by it and the revamping of the debt restructuring framework by the RBI, have created opportunities for revival of these stressed assets. It seems likely that insolvency will drive a substantial portion of Indian M&A activity in 2018. 1 Justin Bharucha is a partner at Bharucha & Partners. The author would like to thank Ayesha Bharucha, managing associate, for her assistance in the preparation of the chapter. 2 The International Monetary Fund has ranked India as the sixth largest economy in the world. See: https://www.indiatoday.in/education-today/gk-current-affairs/story/india-becomes-the-sixth-largest- economy-in-the-world-imf-1215623-2018-04-19, https://www.hindustantimes.com/business-news/india- is-world-s-sixth-largest-economy-at-2-6-trillion-says-imf/story-7wXZPXSWlvvImlAvpLKeNL.html and https://qrius.com/explainer-india-is-the-sixth-largest-economy-in-the-world-as-per-imf/. demonetisation-gst-effects-over-says-world-bank/1135573/, (2) http://thebricspost.com/world-bank- demonetization-chips-away-at-indias-gdp/#.Wt9mXS5ubIU and (3) www.worldbank.org/en/news/press-release/2018/03/14/india-growth-story-since-1990s-remarkably-stable-resilient. 5 Securities and Exchange Board of India. 6 This is further supplemented in view of the recent amendments to the Companies Act, the overarching theme of which seems to be improving ease of doing business. 7 Generally a company may have two vertical layers of subsidiaries. However, three layers are permitted if one layer includes a wholly owned subsidiary. 8 Approval of the National Company Law Tribunal is not required for a merger of two or more small companies and a merger of a holding company and its wholly owned subsidiary. 9 Investing entities will be considered associate companies. 10 The law with regard to filing of notices of combinations with the Competition Commission was revised on 29 June 2017. The contents of the notification will require consolidation. 11 This exemption was previously available only in the case of an acquisition, and the value of the assets and turnover of the enterprise as a whole were to be taken into account instead of the value of the assets and turnover being acquired. 12 Regional rural banks were established by the central government under the Regional Rural Banks Act 1976 with a view to strengthening the rural economy. 13 A central public sector enterprise consists of companies in which the shareholding of the central government exceeds 51 per cent. 14 Illustratively, foreign direct investment in defence is permitted only up to 49 per cent without the prior approval of the government. 15 Aggregate foreign portfolio investment in a company is restricted to 49 per cent or less. 16 Illustratively, tribunals have taken conflicting views on the scope of moratorium vis-à-vis the properties of guarantors. 17 An institutional trading platform is a trading platform in a small or medium-sized enterprise (SME) exchange for listing and trading of securities of SMEs, including start-ups. 18 'Max India pulls out Max Life–HDFC Life Merger Deal', The Economic Times. See https://economictimes.indiatimes.com/industry/banking/finance/insure/max-india-pulls-out-max-life-hdfc-life-merger-deal/articleshow/59842251.cms. 19 The press information bureau release by the government of India dated 6 April 2018 stated that the time taken for grant of recognition certificates has reduced from 10 to 15 days to one to four days, and, consequently, 7,968 start-ups were recognised in 2017–2018. 20 Services include maintaining accounts, registering, trading, settling, clearing, giving loans against virtual tokens, accepting them as collateral, opening accounts of exchanges dealing with them and the transfer and receipt of money in accounts relating to purchase or sale of virtual currencies. 21 See CIT v. Bharat Bijlee Limited TS-270-HC-2014(BOM).